Some jobs require us to have certification. Some clubs require certification. With all of these required certificates, we would need to carry around photo albums! Unless of course you are creating your certificates with ClassMarker because wallet sized certificates have now joined the line up at ClassMarker! We have always offered the option of creating and providing certificates to your users, however now along with portrait and landscape style certificates, creating wallet size and business card certificates is now avaialble as well! You can easily validate certification wallet cards by including unique identifiers to your certificates. These can include Course Codes, Employee IDs, Student Numbers, Serial Numbers, Registration Numbers, License Numbers and more! Creating wallet size certificates is just as easy to do as making a regular sized landscape or portrait style certificate. The only difference is using a smaller background image and a little repositioning of your Test elements that you wish to add! Name your certificate. Ths will not be seen by Test takers, this is for reference only. Upload small wallet sized background image. This can be a business card or other small wallet sized image to use as your background. Drag Test element over background image. Click on Test element to open up the text editor. Use formatting options to set font size as smaller to fit correctly on background image. Continue adding selected elements, along with formatting these as you require. Once you have created your wallet sized certificate, you can then click on ‘Save Changes' and ‘Download .pdf preview’. Once you have finished creating your wallet size certificate, you can then apply this to a Test by going to the Test ‘settings’ page and clicking on ‘Certificates’ under the section ‘Test Completion’. Choose the certificate you want to add, from the drop-down of available certificates that you have created. When users have completed their Test, they can click on the ‘Certificate Download’ link that is included on their results page. They can then print and cut out their small wallet size or business card certifications, to always have on hand. ClassMarker Tip: You can also automatically send Quiz certificates, along with the results to Test takers. When these are sent, the results will include the 'Certificate Download’ link. This is a great opton for those that are not near a printer at the time of taking their Test. 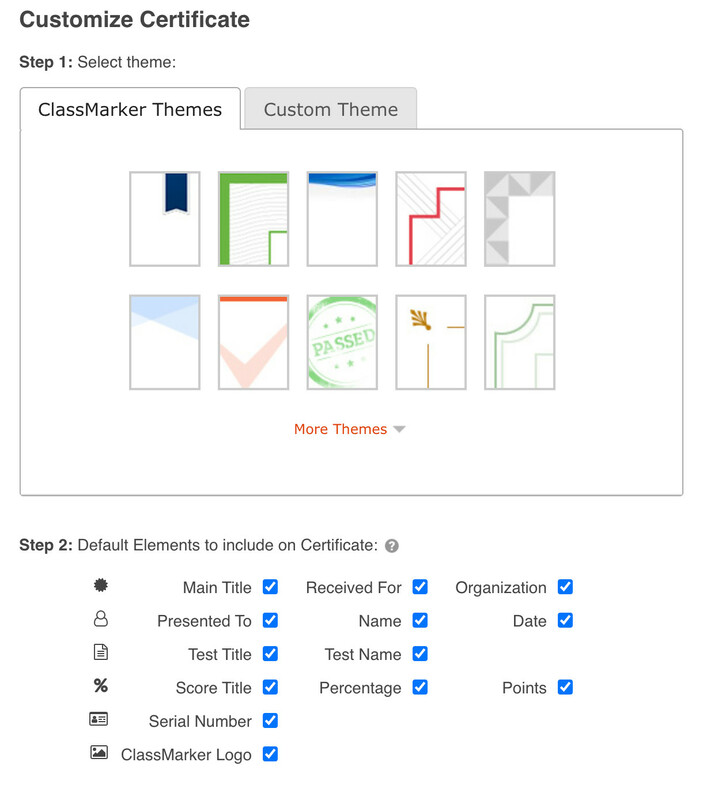 And when it's time for those certification renewals (monthly, yearly or however often a renewal is required) ClassMarker makes it easy for both you and your users. With ClassMarker being an online Testing platform - as long as your employees, students or club members have an internet connection, they can renew in the field, on the job site or anywhere they happen to be. Our users ask how to create small-scale business card certificates for multiple purposes, such as, on-site certificate credentials, easy to carry certificates and easy to distribute and print certificates. Make your wallet size training certificates as distinct as your company. Use ClassMarker's GDPR compliant, ever evolving Professional Online Testing Platform. Used and recommended by both those in Business and Education, since 2006!